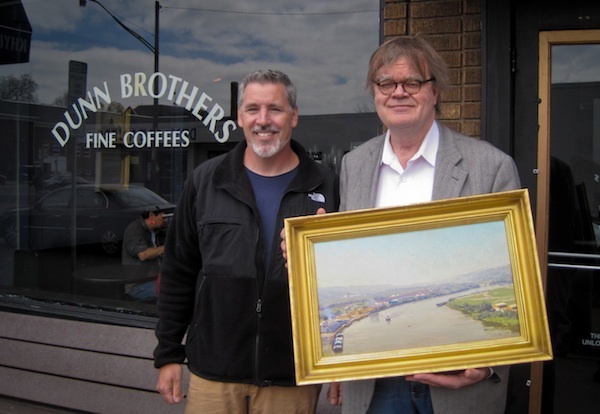 Garrison Keilor, myself and 'Summer on the Mississippi' in front of Dunn Bros Coffee. This Spring I received a message on the studio answering machine. The voice sounded familiar and expressed interest in purchasing "Summer on the Mississippi" which was hanging at Dunn Brothers in St. Paul, my favorite coffee shop. It was only at the very end of the message that the interested party revealed himself - it was none other than Garrison Keilor. I have listened to his "Prairie Home Companion" show for many years. I am a big fan and a total geek and it was a thrill to meet over coffee and hand over the painting. 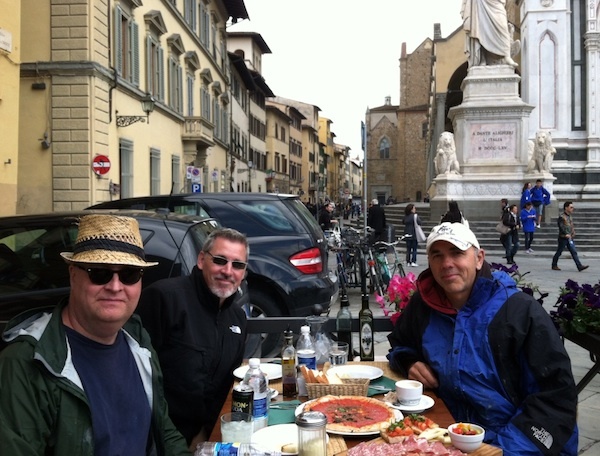 Bob Upton, myself and Carl Bretzke enjoying dinner in Santa Croce. The Italians seem to have written the book on beauty. 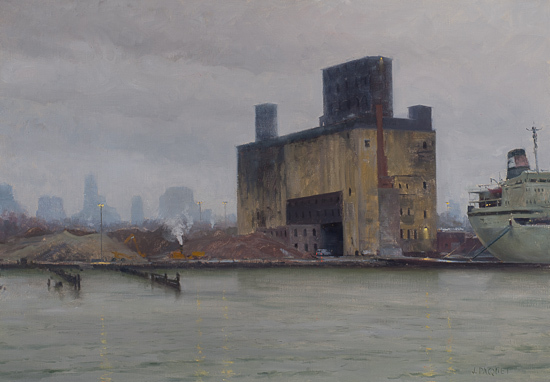 The weather was mixed: violent Spring wind, showers, dramatic sunbursts. All wonderful and challenging to try and capture on canvas. 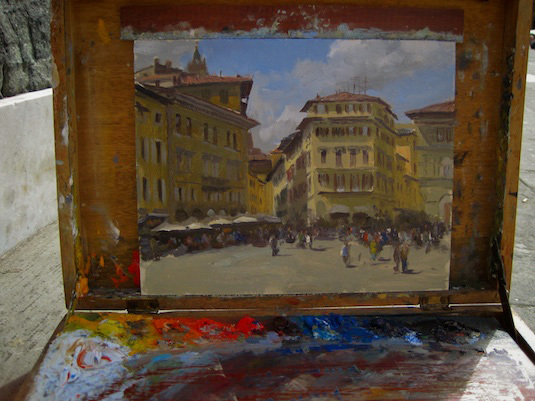 I had the chance To study the Macchiaioli painters and of course, the Maestro - Michelangelo. I felt like I needed a cigarette when it was all over. Further, I had a chance to visit with some old friends and make some new ones. 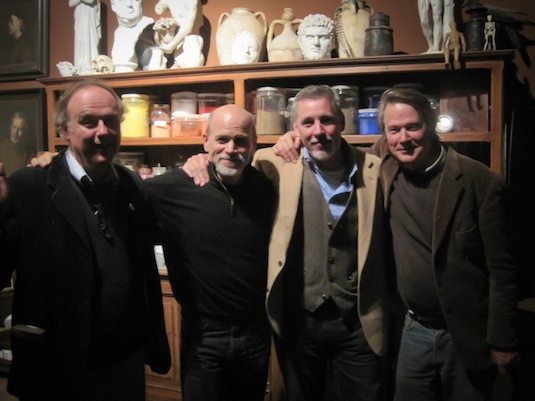 A day in Chianti with Ben Fenske and an evening in the studio of Dan Graves of the Florence Academy of Art with Charles Cecil and Nick Beer of The Cecil Studio. A hardy exchange of ideas flowed in direct proportion to the Chianti. Nick Beer, Daniel Graves, Myself and Charles Cecil in Dan Graves' Studio. Click to view Italian Impressions collection. My workshop with Andrew Lattimore was a great success. The group was full, hard working and intense with a good sense of humor. 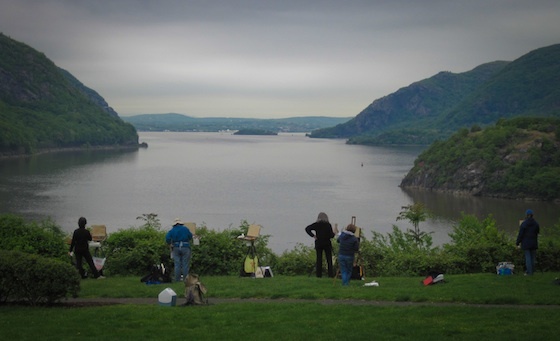 Thanks to all of you who participated and to Alexander Katlan for his group tour at the Salmagundi Club in NYC. We are considering another workshop this coming Winter/Spring which would be split between my teaching Composition /Design and Andrew teaching Portrait & Portrait Anatomy. This will be my third time teaching this workshop with the added benefit of an extra day. It's a magnificent time to be on the Cape! 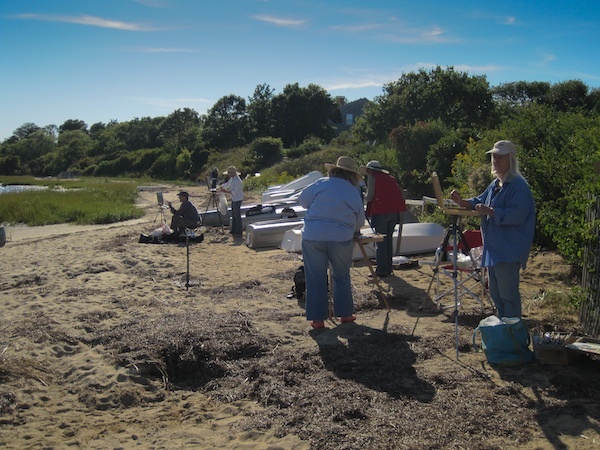 For More information, visit the CCAC at capecodcreativearts.org to register or call (508) 945-3583. This painting found a great home and steward.